This page contains links and information on software for DVB-T, DVB-T2, DVB-S, DVB-S2 and DAB for use on computers with a PCI card or USB dongle. Some programmes are freeware, shareware or commercial, this is listed next to the programme along with which operating systems they are available on. Software for HbbTV, MHEG-5 and VoD content is also listed. If you know of any programmes or sites not listed, please contact the site. ALTDVB application allows you to experience Digital TV on your PC. With a DVB-S satellite card, you can enter the world of digital entertainment and experience high quality, incredibly sharp TV pictures and near CD quality radio! More then that..it’s FREE! The programme is no longer maintained or updated. The DirectShow (DS) engine (from version 2.0) is very noticeable. It allows the user to easily select and configure the installed MPEG2 decoders. As of version 2.2 AltDVB supports BDA driver models. This makes it possible to use AltDVB with considerably more DVB cards and USB dongles. AltDVB provides a fairly wide range of functions. Additionally, you can integrate other plugins and thus additional functions via the plugin interface. 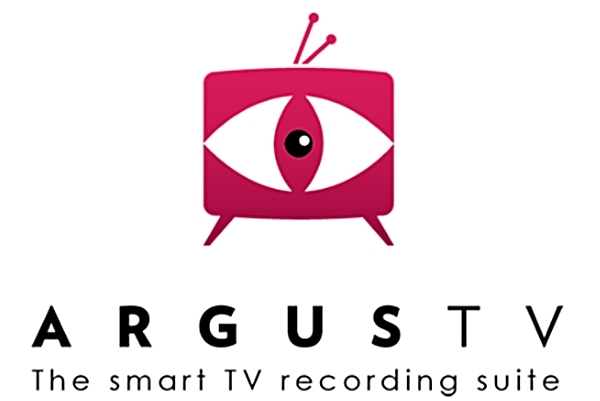 ARGUS TV is an advanced rule-based scheduling system to record TV programs in a very intelligent way: It has full support for running as a service with multiple front-end clients. Access to the system is available ranging from a typical Windows application over plugins for living-room Media playback software to internet Web Access to give you the maximum possible reach. The scheduling & suggestion system is rule-based and offers unparalleled power to record or suggest exactly what you want. Because the scheduling system is rule-based it offers unparalleled power to record exactly what you want. The examples below can be easily set up in a single schedule definition each. Record any “CSI” episode shown somewhere between 7 PM and 11 PM, but not the ones from “Miami”, and don’t record episodes that have been recorded before. Record “The Simpsons” every Monday and Wednesday on Channel Foo around 7 PM (so also when it’s shown at 7:15 PM or 6:55 PM). Record all movies with “Samuel Jackson” on BBC1 or BBC2 and don’t record movies that have been recorded before. Record all documentaries on NGC or Discovery Channel that have “Global warming” in their description. ARGUS TV has conflict management built-in to help the scheduler record as many programs as it can, based on your available recording devices. It will let you intervene manually as well. ARGUS TV is very modular thanks to its Service Oriented Architecture. The recording is handled by modules (services) that are called recorder/tuners. You have the choice between its native ‘Argus’ recording engine (for digital TV – DVB and ATSC) or the recorder/tuner for MediaPortal TV Server. Recorded shows are stored on your system’s hard disk and can be played back manually, from the ARGUS TV Scheduler Console or via various clients. 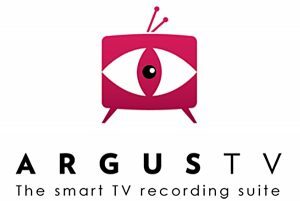 ARGUS TV can also be used to watch Live-TV, either via various clients or via your favourite Mediaplayer, using our RTSP-Streaming server. DAB player software for the Noxon stick (and all compatible “derivatives” with RTL2832 chip). In addition to a very fast switching time, the software provides a lot of information about the technical parameters of an ensemble or a programme. In addition, a single channel search can be started which the original software from Terratec does not offer. dtvTools offer a whole suite of DVB tools, unfortunately not for free. Broadcast Analyzer provides a comprehensive feature set for real-time analysis and monitoring of Digital TV and Mobile DTV broadcasts on all technical layers. The Transport Stream Analyzer provides comprehensive analysis features, to be used with recorded DVB, ATSC or ISDB Transport Stream files. The SNMP Agent provides comprehensive monitoring features on all technical layers and an SNMP MIB consisting of more than 1000 SNMP operations and traps. The SNMP Client ‘SAMager-Console’ is a comprehensive Network Management System (NMS) software for operators, service staff and system engineers, especially suited to monitor Digital TV and/or Mobile DTV networks. The comprehensive SNMP based monitoring capabilities of SAMbuddy-RF allow to establish powerful RF monitoring solutions. SAMbuddy-T2MI is the most comprehensive T2-MI Analysis solution which turns your PC or laptop into a fully featured T2-MI analyser. Loudness Measurement and Monitoring according ITU-R BS.1770.3, EBU R-128 and ATSC A/85, incl. True Peak Measurement for all sub-channels incl. oversampling for enhanced accuracy, Loudness Range calculation and much more. Feature-rich mosaic wall for rendering all video and audio content of DTV and MDTV broadcasts. DVB-T and DVB-T2 Coverage Measurement and Drive Test solutionb by using of common RF- and GPS- receiver hardware. The solution turns a laptop into a powerful coverage measurement and drive test device. 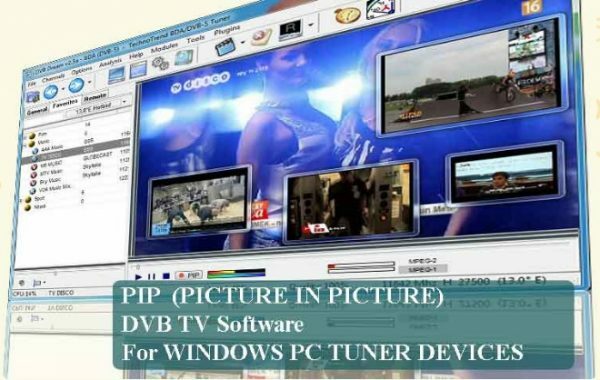 DVB Dream is proprietary software for watching & recording of digital TV & radio with help of a digital TV tuner card (Internal PCI / PCI-Express cards or external USB devices). It supports the standards DVB-S/S2 (satellite), DVB-C (cable), DVB-T/T2 (terrestrial), ISDB-T, ISDB-S and ATSC. It has STB-like features including PIP (Picture-in-picture), record, Timeshift, EPG, Scheduler, Unicable support, Positioner support(including GotoX.X / USALS), UHD(4K)/HD/HEVC/H264 support, child lock, remote control support. There are also features that cannot be seen on STBs but provided with help of flexible Windows GUI environment. These are: Multi PIP (watching more than 1 channel at the same time), Multi-record (recording more than 1 channel at the same time), LAN Streaming, VLC or MPC Integration, Auto-zap, Unique channel list system by grouping/ordering/filtering by several flexible options, Render-less mode, Multi-monitor support, Command line support, Plugins support. Being a Windows application, the user interface can be customized with help of themes and foldable GUI elements. DVB Inspector is an open-source DVB analyzer, written in Java. It can show the logical structure of the DVB SI and PSI data. It also shows bit rate usage data. DVB Inspector can be used to analyse contents; MPEG Video structure, Teletext, DVB subtitles, DSM-CC Object carousels. DVB Inspector offers six different views of a transport stream; A tree view (for logical analyzes), a EIT view (fast overview of EIT information), a bitrate view (to see bitrate alter over time), a bar chart view (summary of average/minimum and maximum bitrates), a grid view (to see how different PIDs are distributed over time) and a PCR/PTS/DTS graph (to see the relation between the different time stamps of the components of a single service). This site is dedicated to digital video, streaming and television. Here you find the tools needed to enjoy digital television and to create content for television, streaming, local playback, mobile devices, set top boxes, PCs and consoles. You can choose between different, highly efficient compression methods and different containers optimized for streaming, local playback or broadcast. myHTPC is a highly customizable, menu-driven front end that allows you, among other things, to launch external programs, browse pictures and large collections of almost any type of media stored on your computer. Choose from skins to modify the appearance of DVB Portal TV Viewer. The DVBViewer application allows you to receive digital TV (DVB) on your PC. With a suitable DVB card or a SAT>IP Server you can enter the world of digital entertainment and experience high quality, incredibly sharp TV pictures and near CD quality radio! In addition to the basic features like reception of digital television and radio, the DVBViewer offers several advances treats. A complete user definable surface allows you to control the program. Services like Teletext, HbbTV, MHEG-5 (purchased separately) can be used, as well as scheduling the recorder via EPG (electronic programming guide). Advanced algorithms, derived from industrial processes, allow the parallel usage of multiple devices. The parallel usage of multiple devices is one of our core competencies. Ingenious algorithms, usually used to optimize complicated workflows of industrial processes, are used to manage your available devices. The DVBViewer offers groundbreaking features: As worldwide first programme capable to display additional content via HbbTV on a PC and by now it also supports Ultra HDTV. As a worldwide exclusive PC application, it is also capable to present additional services via HbbTV or MHEG-5. A configurable multimedia centre allows you to comfortably manage your own music- and video files even with a remote. With modern graphic adapters and intelligent algorithms (Lanczos, Mitchell-Netravali, Nearest Neighbour etc.) the DVBViewer coaxex the maximum out of your TV stations and videos. Watch, schedule and record live TV – like a TiVo, but more, and for free! MythTV is a collection of software that provides digital video recording functions (PVR or DVR–personal, or digital, video recorder) — a computerized VCR, similar to a TiVo or a Replay. It runs under the Linux operating system. Since it’s open source software, if you don’t like the way it does something, you can always change it — that’s how much of its current functionality came about in the first place. With MythTV, recordings can be scheduled from a listing service to record all episodes of a program, or they can be manually scheduled based on day and time. MythTV keeps track of previously recorded episodes so that it can catch up on missed episodes without re-recording ones already seen. MythTV allows watching of live TV together with the ability to pause, rewind, fast forward. MythTV also has built in the ability to play videos from the file system, from a server, or DVDs. It can also play video DVDs. Most types of video are supported, but not DRM protected content. Encrypted DVDs can be played if you install libdvdread4 (available separately). In addition to the basic PVR functions of recording and playing back scheduled programs and allowing you to schedule recordings automatically in advance, MythTV has a plugin system that permits it to be extended by other programmers. Plugins currently exist for viewing photos, listening to music files, using your TV and a web camera as a video-telephone over the Internet, browsing the web, retrieving current local weather, and many other functions. There are two types of plugin for MythTV, official, and Unofficial Plugins. OpenMheg is an MHEG-5 engine for Windows users. 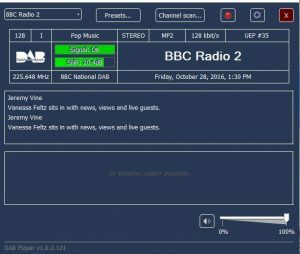 It allows you to view over-the-air interactive services, such as BBCi and Teletext in the UK and other regions that make use of MHEG-5. It comprises a framework for MHEG-5 that includes a working engine compliant to UK 1.06, an XML parser and ASN1 parser, and a GDI renderer. ProjectX is a demultiplexing, editing and repairing tool for MPEG2, TS, DigitalTV Transport streams. Requires Java. Under More downloads below can you find some versions that does not require JAVA. This programme is no longer developed. Designed with a clean and simple UI your grandmother could use. SichboPVR v3 was built from the ground up with a custom Direct3D video presentation and user interface framework for smooth-as-butter DXVA2 video and sharp scalable graphic composition. Advanced DVB transponder Explorer and centralized DVB PSI mesh lets you find and share local frequencies. SmartDVB is an unpretentious digital-tv watch application for satellite, terrestrial or cable TV cards. Emphasis has been put on overall speed and user experience on the desktop concerning DVB operations like scanning and channel viewing. It also allows for HTPC/PVR functionality through SmartOSD and legacy video renderer OSD. New OSD includes Options menu for quick PVR like access, better-integrated EPG, Teletext, graphical timeshift, program data, zoom, custom graphics station list and also logo support. If you’re looking for a solid all-round DVB experience using the current renderer technologies like EVR (Enhanced Video Renderer), try it out! If you have any problems or queries feel free to contact the author through the forum or e-mail. SmartDVB also provides excellent feed hunting capabilities, providing extensive channel information and also includes a functional blindscanner for devices which support hardware blindscanning and a stream analyzer. The normal, non blindscan, scanner also is tailored towards being swift, configurable towards your needs and providing as much information as possible with regards to the scanned frequencies and channels. The used frequency lists can be updated, or better said synchronized, from various sites on the internet which provide such lists. So whether one blindscans or not you have the possibility to keep your frequency lists up to date. Field tested for many years now you can be assured the scanner won’t miss many of your favorite stations or feeds. TSReader is a transport stream analyzer, decoder, recorder and stream manipulator for MPEG-2 systems. It supports DVB, ATSC, ISDB, and Digicipher® II extensions to the base MPEG-2 specification. TSReader gives the user the “big picture” overview of what’s being carried inside MPEG-2 transport streams and can be very useful for finding errors or inefficiencies. If you’re not familiar with MPEG-2 transport streams. TSReader was developed because we saw a need for a reasonably priced MPEG-2 transport stream analyzer that when exposed to a stream coming from a file, satellite, terrestrial, cable, or IP source would show an overview of the channels and tables carried in the mux along with decoding of many aspects and implementations of MPEG-2. TSReader comes in three different editions – Lite, Standard and Professional. 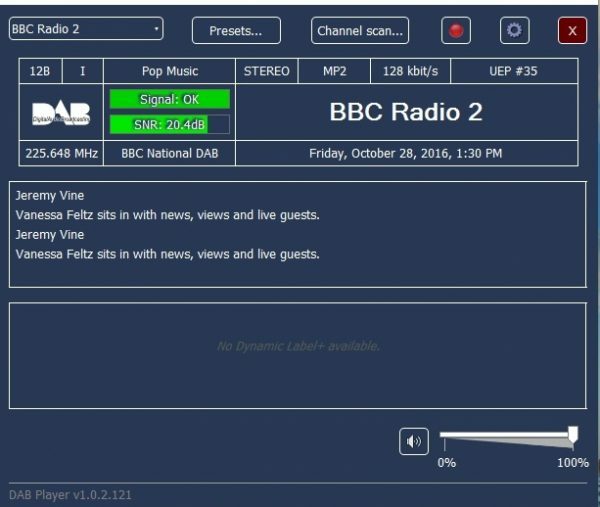 A third party tool for accessing BBC iPlayer content, a utility for downloading TV and radio from BBC iPlayer. A UK IP address is required. get-iplayer can only search for programmes that were broadcast on BBC linear services within the previous 30 days, even if some are available for more than 30 days on the iPlayer site. Any programmes that are still available after 30 days must be located on the iPlayer site and downloaded directly via PID or URL. get-iplayer does not support downloading news/sports videos, other embedded media, archive sites, special collections, educational material, programme clips or any content other than whole episodes of programmes broadcast on BBC linear services within the previous 30 days, plus episodes of BBC Three programmes posted within the same period. It may be possible to download other content directly via PID or URL, but such use is not supported.